Bethesda’s Barrel and Crow is many things. It’s a shining star among the multitude of decent, but not so exciting Bethesda restaurants. It’s a place with a rustic/hip ambiance that is becoming commonplace in DC, but is still unique for the suburbs. 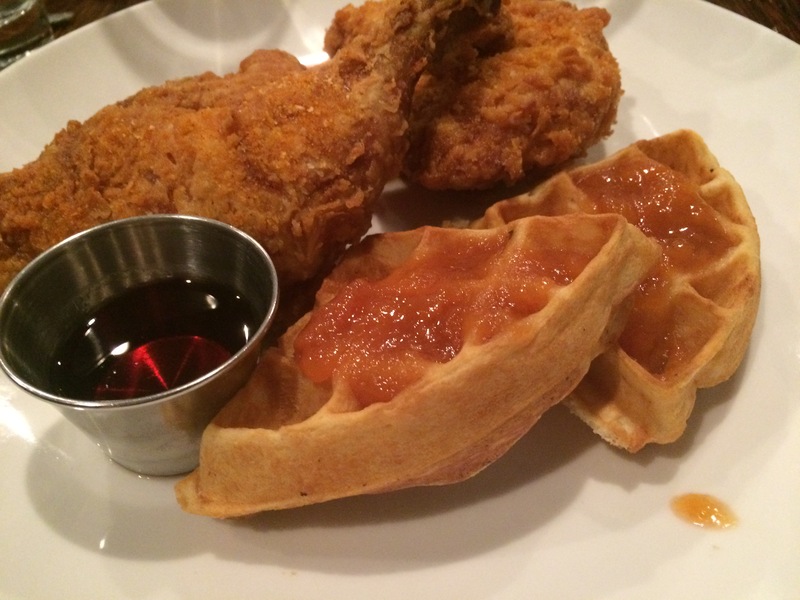 But above all, it’s a destination for incredible fried chicken. In fact, I think it could be the best in the entire DC/MD/VA area, although I admit I have more sampling to do before I can credibly proclaim this. Barrel and Crow Executive Chef Nick Palermo perfected his fried chicken at Old Angler’s Inn in Potomac. Don Rockwell (donrockwell.com) says the secret is the sous-vide technique. The result is a bird that is delightfully crispy on the outside and astonishingly moist on the inside. I take one bite and from that point on, am oblivious to everything else. In fact, I may have ignored my dining companions. If so, I apologize. My single-mindedness also means that I pay little attention to the waffle on this fried chicken and waffle dish, although it is a handy vehicle for the peach compote topping. Pressed watermelon is a refreshing seasonal accompaniment. 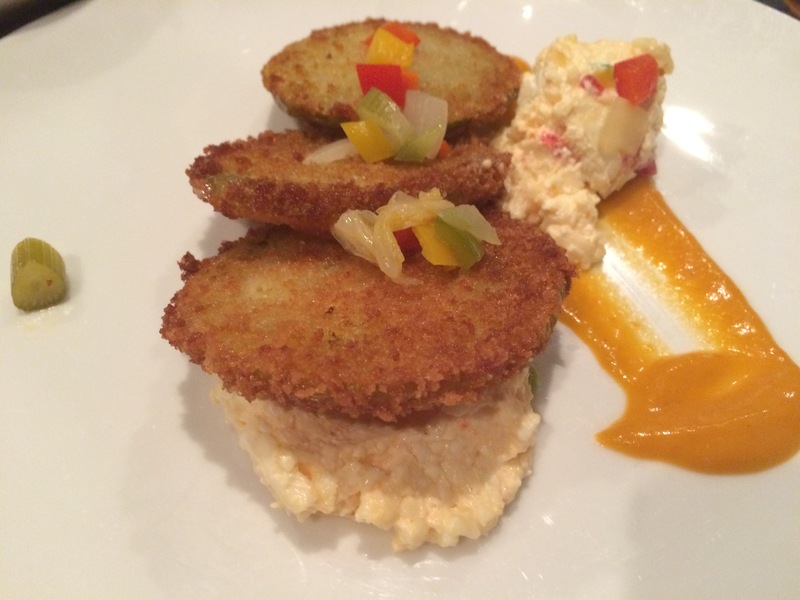 Barrel and Crow describes itself as having “a contemporary approach to regional cuisine.” One example are the fulfilling crunchy fried green tomatoes, with house made pimento cheese and a swipe of spicy pepper jam. I will need another visit to partake in other dishes such as Virginia mackerel and Chesapeake Bay rockfish. Maryland crab beignets are also calling to me. And next time I will leave room for desserts by pastry chef Rita Garruba, whose work I enjoyed at 8407 Kitchen Bar in Silver Spring. The meaning of the name Barrel and Crow has to do with standing on a barrel and crowing with exaltation, according to Tom Sietsema in his Washington Post review. I get it. It’s what I feel like doing after eating that fried chicken.